Telling the time is an important skill in everyday life, but it can be tricky to learn. Before your child will be able to tell the time on a clock they will need to grasp how time relates to their own experiences. You can start to increase their awareness of time from a young age with simple activities and games - here are some fun ideas to get you started. Make sure your child is confident with numbers and counting from 1-60 as this will make telling the time easier. Practising the five times table will also help. Start with analogue clocks rather than digital clocks. Focus on telling time to the hour and half hour. Put a clock in your child’s bedroom. 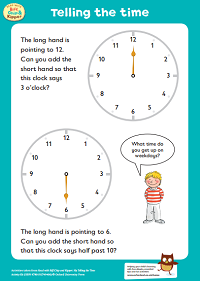 Ideally it should have a clear hour hand and half hour hand as this will help them to understand that the short hand shows the hour and the long hand shows the minutes. Talk about what you regularly do at different times in the day. Compare and contrast weekdays and weekends, if there are differences. Use time vocabulary such as today, yesterday, now, afterwards. Let your child remind you that it’s time to do something! Your child should be taught to tell the time at school in maths from Year 1. However, there isn’t much time at school to practise this skill, so practising at home is important. 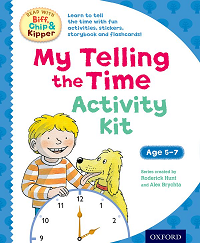 Aimed at 5 - 7 year olds, My Telling the Time Activity Kit introduces the concept and language of time to children through fun, interactive activities featuring Biff, Chip and Kipper from the popular Oxford Reading Tree scheme. 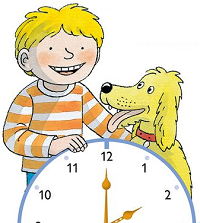 Kipper Tells the Time Storybook – Read and share with your child to build an awareness of routines, sequences and the language of time. 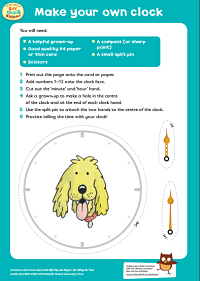 Telling the Time Workbook – A fun activity and sticker book for children to practise telling the time on both analogue and digital clocks. Flashcards – Help to develop skills through interaction and play. Tips for parents – Advice on how to use this pack to bring learning to life.